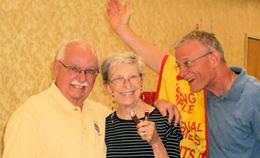 The days of June 6 to June 10 were a perfect sunny weekend for our council's annual Tootsie Roll Drive to benefit various groups supporting people with intellectual difficulties. Pete Klecan, our chairman, supported by able lieutenants Gene Bryant and Bill Silverstri, headed a team of loyal minions composed of more than 35 Knights and 50 other volunteers to work at 11 store fronts in Salem, as well as our parish churches and the Salem transfer station. While the shoppers in Salem saw our volunteers handing out Tootsie Rolls and collecting, they did not see the many tasks that go into making this drive a success. Pete, Gene, and Bill mailed letters to the town for Salem's approval and more letters to each store, asking for their approval to solicit outside their stores. Counters worked to total the monies, while separating US coins from Scrub-a-Dub car wash tokens and Canadian money. Donuts, hot dogs, snacks and drinks were supplied to keep the volunteers happy. This was definitely a group effort. We broke last year's record with $14,893 collected. 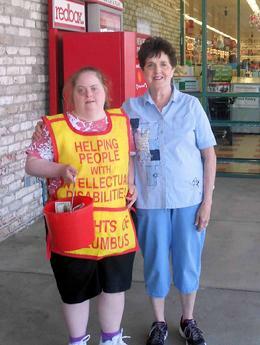 Jan and Irene Groulx on duty at "Old Market Basket"